Description: Miniature county map of Worcestershire based on the geography of John Speed. Coloured. Description: County map of Worcestershire based on the work of Christopher Saxton and engraved by William Hole. Coloured. Description: Worcesterhire and Warwickshire. Original Colour. Description: County map of Worcestershire. The elaborate dedication is to Henry Somerset, Marquess of Worcester and later 1st Duke of Beaufort. Description: RARE. County map. Decorative cartouche. Coloured. 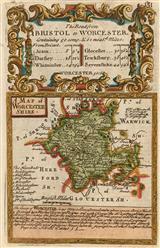 Description: Early miniature county map of Worcestershire with decorative cartouche. Coloured. Description: Decorative county map of Worcestershire, with decorative cartouche. Coloured. Description: Hereford to Leicester via Frome, Worcester, Droitwich, Solihull and Coventry . Early road map in strips from John Ogilby's landmark atlas, "Britannia". Coloured. Description: Early road map showing the route from Worcester to Bromard, via Evesham and Pershore. Coloured. Description: County map. Includes historical text and distances. Description: County map. Text running along the side of the map. Coloured. Description: County map. Decorative title. Coloured. Description: County map. Important map from the "Large English Atlas". Set within numerous panels of text. Original colour. Description: County map. Scenic cartouche. Coloured.